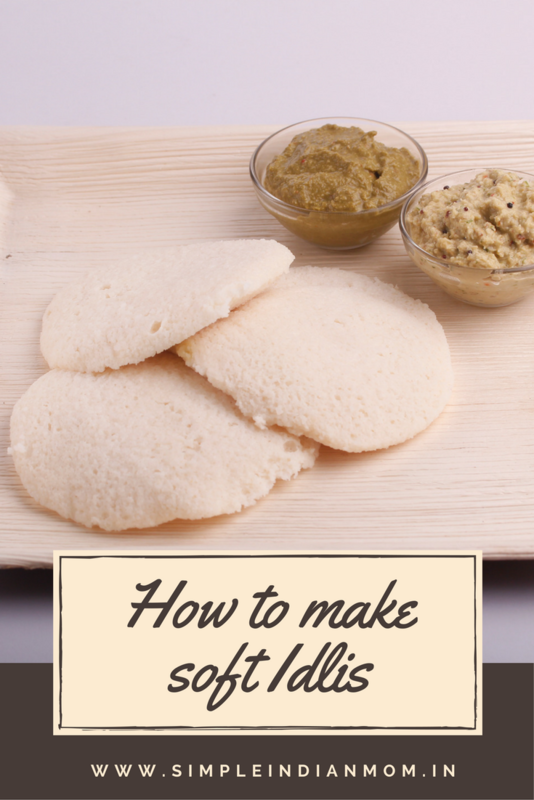 How do you actually make such soft idlis -ask most of my friends, well here is the secret behind making softest idlis. In South India, the nest breakfast preferred by people of all ages is Idlis, and not without a reason. It is one of the healthiest protein packed breakfast served with a chutney or with sambar. Infact Idlis are the most nutritious breakfast one can have. As they are prepared with a fermented batter these are easily digestible and makes it suitable to all including babies to folks on diet and people who have poor digestion. What makes the idli sublime is the texture of the idli. What special ingredient make idli soft? I know you just scrolling this part off because it is not a secret and most of you have already tried making idlis – with or without success. This is the ratio I use and have been using for a long time now. However there are people who use 5:1 and even 6:1 this largely depends on the quality of urad dhal. If you the urad dhal is new, you sure will get a fluffy batter when you grind it. That in itself is an indication of how much rice can be added the next time. However, 4:1 ratio has proven best for me. Wash the ingredients and soak them for minimum 4 hours. The Grinding Process is where you need to be careful, I have seen many people use the mixie or the mixer -grinder. This is where you make the mistake in not getting to make softest idlis. Mixie is not good when it comes to grinding smaller quanties of chutneys or some powders, but when you want to grind urad dhal it does not succeed in making the batter fluffy. This is mainly because the mixer grinder works on the principle of cutting larger pieces of materials to tiny ones, however what we what we want here is not just cut the rice and dhal but grind them. So use a wet grinder. The wet grinder grinds the urad and dhal bringing the fluffiness and porosity during the grinding process. Infact you will experience that while grinding in mixei the jar will become hot during the process, and also there is a lot of water required to make the mixer work. This hinders the process of bringing enough porosity into the batter. You need to grind the rice first, make sure not to make it too pasty, it should be just the size of sooji. I have kept a thumb rule that 13 minutes and 25 minutes for urad dhal. Mix the batter together with required amount of salt with your hands and let it ferment in a warm place for 5 to 8 hours. The quality of the rice and urad dal is very important and always use full urad dal without the black skin. Don’t use old stock or low quality dal or split dal. If you can get organic rice and dhal -that’s the best. Soaking is also equally important where rice and dal has to be soaked for 5-6 hours. The consistency of the batter is also important as if your batter is thin then the idli will be flat or if the batter is thick then your idli will be hard. So one should add water little by little depending on the consistency. One can use idli pot or a steamer or pressure cooker without weight for steaming. Ensure that to bring the water to boiling point before steaming the idlis. Menaka, this is one I’ve never heard of it, and it sounds wonderful! It’s so different from anything I’ve ever had for breakfast. Like you, I’m all about organic. Wow!! I didnt know one needs a different grinder for the idli making batter! Thanks for sharing! I also use the same ratio, and I also add a handful of puffed rice( poha) to the rice when its soaking. The idlies are quite soft.